"Radio apparatus of today, including television, uses practically all of the physical phenomena capable of being controlled by science." That is the opening line of a 1932 article discussing the relatively new technology dealing with the generation AND controlling of electrical charges. Investigators were beginning to develop formulas and physical rules for the behavior of electrons - at least in accordance with the accepted Rutherford-Bohr atomic model. It wasn't until 1929 that Robert Van de Graaff invented his eponymous generator, before which scientists like Volta used an electrophorus (Latin for "electricity bearer") to generate static electrical charges for experimentation by beating a metal disc with an animal skin to transfer electrons. By 1932, Heisenberg's quantum mechanical theory of matter was coming into dominance, and not too much later it would be necessary to apply laws of relativity to explain the reason why fast-moving streams of electrons (beta rays) inside recently developed cathode ray tubes did not deflect as much as predicted based on classical Newtonian models of force and acceleration. 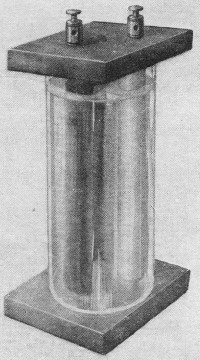 This complicated lamp which is used for television combines the phenomena of ionization and production of light and necessitates an understanding of the Kinetic theory of gases and the science of electronics. In the days of "wireless" and crystal detectors we did not have much technical ground to cover. Current electricity, magnetism, electrostatics and electromagnetics sufficed for us to have a fairly intelligent insight into the working of our apparatus. But the vacuum tube and its rapid development opened a new realm and its apparently unlimited versatility has kept us studying ever since. 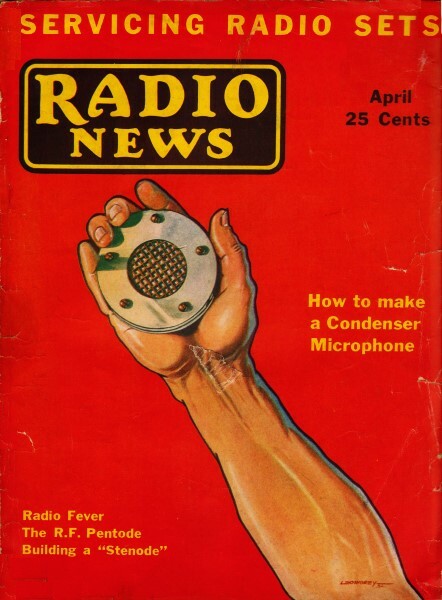 Then the vogue of broadcasting, bringing in the microphone and the loudspeaker, confronted us with the study of sound. Further, the circuits required for the handling of frequencies became much more intricate than those used with our early headphones and code signals. Now, with television stepping on the stage, even more is demanded of us. Electronic effects, known only in the laboratory a few years ago, are in common use. We have to understand optics, piezo-electric devices, light valves, cathode-ray scanning - and this list is increasing daily. This means that we have to review our physics, brush up on optics, and even if our time does not allow us to read the many technical reports on electronic research, we can, from time to time, study a resume of the more important items. With this in mind, the present series of articles was planned. For a better correlation of the various fields of physical action, and in order to reduce our explanations to the simplest terms, we can begin with a review of the present theories of matter and energy. 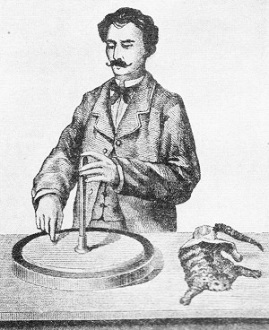 With this as a background we can proceed to the electronic and photo-electric effects, such as the Barkhausen tube and the production of the so-called quasi-optical waves and other effects of interest at the moment. Optics need more than passing attention; the neon tube as a source of light for television and the polarization of light and the means, such as mechanical, electric and magnetic devices, for controlling its action. Next there are a number of magnetic effects which are interesting. Some are being used. for example, magnetostrictive action; others are being worked with and give promise of becoming important. Finally there are certain miscellaneous electrical and chemical phenomena to be touched upon. The three units with which the physicist attempts to explain all the phenomena of the universe are: the electron. the proton and the photon. The first two of these involve matter and electrical charge, which, of course, is a form of energy; the third deals with energy alone. The electron is the smallest particle of negatively charged matter, and the proton is the smallest particle of positively charged matter. The photon is a unit of radiant energy and is the smallest amount of energy of any particular frequency. In the above definition of electron and proton we see that matter and electrical charges are tied together and both are reduced to a concept of individual particles. There seems to be no way of getting away from this double definition - of disentangling the two, matter and electricity - for an electrical charge has never been absolutely separated and observed as such, and matter in any of its forms has never been shaken of its ever-attendant electrical properties. If we open an elementary textbook on physics we find that matter is defined as anything which occupies space and which possesses certain properties known to us through our senses. We know from our experience that electricity is a form of energy, that energy is commonly defined as the ability to do work. Modern theory, however, has more to say on these points. The solid atoms of half a century ago which were considered as occupying space, in a literal sense of the word, are now thought of as merely centers of attraction or repulsion. electrical in nature, and an even more radical conception pictures the electron as a group of waves. Light, radiant heat, and radio waves. all of which are forms of energy, have been shown to differ only in their frequency of vibration. Thus slowly the idea that matter and energy are the same, or that they are both expressions of a more fundamental cosmic property, has gained ground; that matter may be transformed into energy and pass off in radiation similar to radio waves, under certain circumstances, and conversely that energy may be converted into matter at some distant point of the universe is accepted by such authorities as Millikan and Jeans. We shall have to assume that the reader is familiar, in a general way at least, with the Rutherford-Bohr atom model and that he understands the arrangement of the electrons and protons in the atoms and how the atoms of one element differ from those of another. Let us recall to mind certain details. In the normal state the positive and the negative charges, within the atom, balance each other, leaving the atom electrically neutral. Disturbing forces may result from a change caused by the distribution of the charges in the atom; mechanical impact of atom with atom, or atom with electron; or radiant energy, as a stream of photons, for example, light or X-rays which disturb the inner atomic forces. Some of the planetary electrons are less tightly held in their orbits than others, and therefore a disturbing force may be able to "knock" them entirely out of the atom or to cause them to move to other orbits for a period of time. An atom may also temporarily attract an additional electron. But whenever the normal state is disturbed and there is either an excess or a deficiency of electrons, the condition is unstable and as soon as the disturbing force is removed the atom will tend to assume its normal neutral state with all of its electrical forces balanced. Lastly, since the electron has only 1/1800 of the mass of a proton, practically all of the mass of an atom may be considered as residing in its nucleus, which explains why electrons move at much greater velocity than atoms or ions. The old and new ways of producing electricity are illustrated above. At the left is the electrophorus. A resinous cake is beaten with cat skin and negatively electrified. A metal disk is placed upon it so that it is charged negatively above and positively below. When touched with the finger the negative charge is neutralized and the metal cover may be lifted by the handle and will be found to be charged with high positive potential. In the newer method, as shown at the right, Dr. Van de Graaf is able to produce over a million volts between two large metal balls by revolving bands of silk with a motor so that frictional charges are built up on each of the balls . So much for the individual atoms. The attractive and repulsive forces which hold the electrons and the protons together, within the atoms, are also used to explain the association of one or more atoms in definite arrangements in the formation of molecules. In such a process electrons may be radically redistributed. The orbits of the electrons of each atom may become interlaced and in certain cases an electron may revolve around two nucleii. In any event, the combination of atoms to form molecules is very complicated and we need not consider the details of the process but only remember that matter in any form, gaseous, liquid or solid, is built up out of atoms and atom groups. In crystals the spacing is very regular, but not necessarily the same in the three dimensions, and in complex molecules (organic compounds) composed of a thousand or so atoms the relation of one atom to another remains the same within certain limits, else the compound breaks down into simpler arrangements. In all material, however, there is "open space" between the atoms and molecules which is vast, relative to the sizes of the atoms and electrons. This openness of the structure of solid material is difficult for us to appreciate, for if atomic distances are given in the usual units used to measure them, they mean little to us. A comparison, however, will make these space relations within matter more easily appreciated. Millikan, in his book on the electron, says of its size: ... "Its radius cannot be larger in comparison with the radius of the atom than is the radius of the earth in comparison with the radius of her orbit about the sun," ... "The electronic or other constituents of atoms can occupy but an exceedingly small fraction of the space enclosed within the atomic system." This explains why it is possible for high-speed electrons and even helium atoms to be shot through the glass wall of a highly evacuated tube without, in the slightest, affecting the vacuum of the tube, for these particles can pass as readily through solid matter as a comet can pass among the planets of our solar system. It also explains why sodium of potassium can be passed, by electrolysis, through the solid glass of an ordinary electric-light bulb for the preparation of a photoelectric cell. Let us take for example a metal conductor, a piece of copper wire. The atoms are spaced with the same relative openness as we have just considered. The electrons of the atoms revolve around the nucleii, and the atoms themselves are moving and turning in every imaginable manner, due to thermal agitation, and in their state of continually rushing about they are colliding with one another. In a collision of one atom with another an interchange of energy may take place, one atom may lose momentum, the other gain it. There may be an interchange of electrons, electrons may be knocked free of the atoms or caused to change their orbits, or energy may enter the body in the form of photons. The possibilities are innumerable. What is the importance of considering these general cases, we may ask. The importance is that if we have a reasonably clear picture of what theory says is taking place, we will be able to apply simple reasoning to the various phenomena, such as piezo-crystal action used for constant-frequency oscillators; magneto-strictive effects used in loudspeakers, in oscillators, and in measuring instruments; photoelectric phenomena. so important in television and in talking pictures; why a vacuum tube without a heated filament is possible; why photoelectric cells are more sensitive to light of one color than to another; how polarized light can be controlled by electric fields and other phenomena being used in both radio and television. Returning now to our piece of wire - a great number of atomic and electronic interchanges of energy are taking place resulting in the liberation of free electrons. These electrons, in the case of copper, do not get very far before they attach themselves to other atoms with never a relatively great number of electrons free at any instant, due to the magnitude of the forces within and between the atoms of copper. When a potential is applied to the wire the electrons will tend to drift in one direction, constituting the current through the wire. There are, as we will see later, some elements in which the production of free electrons at ordinary temperatures is sufficient to be useful. Now suppose we heat one end and make provision to keep the other end cool. The agitation of the atoms will be increased in the heated portion, thus increasing the number of free electrons, which means a difference of potential between the two ends of the wire, the hot end becoming negatively charged (for iron, this effect is reversed). Here we have the heat, the kinetic energy of rapidly moving atoms, being transformed into an electric potential. This is known as the Thomson effect. There are many other interactions of heat and electricity which we will consider in more detail later, some of which are worth studying with an eye to useful application, for there is always the possibility of applying a well-known effect in a novel way. We have a beautiful example of just such in the apparatus very recently developed by Dr. Van de Graaff at the Massachusetts Institute of Technology for the production of a potential of 1,500,000 volts, in which he made use of the friction of an insulating material against two rapidly moving belts of silk, each belt charging a large metal sphere, between which the potential was developed. The production of electricity by friction has been known for centuries, but never has been so cleverly applied. Many have attempted to produce these high voltages, but no one has used such a simple apparatus. The Van de Graaff apparatus costs about $90, while more complicated machines, such as generators and transformers, cost many thousands and are much less reliable in action. 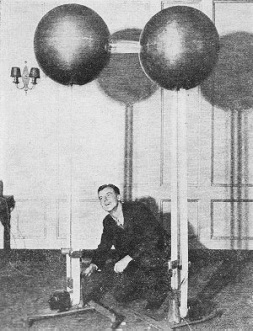 We may add that Dr. Van de Graaff is building a much larger apparatus with which he expects to develop as high as 15,000,000 volts. There is serious talk of considering a modification of the apparatus for the commercial production of small current, since as an electrical machine it is very efficient. At the moment this may seem remote in interest from radio, but it is not impossible that such a machine might be used to good advantage for supplying small, steady currents for tubes. Again returning to the copper wire: any mechanical disturbance of the piece of copper will effect the motion of the atoms and the distribution of the forces within and between the atom, thereby affecting the balance of free electrons and the rate at which collision and interchange take place. Compression, tension, twisting, bending, any external force has to be met by a rearrangement of internal forces and such a rearrangement changes all the so-called properties of the copper electrical, magnetic, thermal, optical (in the strict sense of the word the piece of copper isn't the same). In fact, we are justified in making a generality: if any change is made in one of the physical or chemical properties of a substance, inevitably changes occur in all the others. On first consideration such a sweeping statement may seem entirely unwarranted, for the question may be asked. "Do you mean to say that if light falls on a piece of copper its electrical actions are changed, or the reverse? Does this mean that sound waves impinging on the copper would change its resistances or that a magnetic field would result in optical changes?" Yes, it means just that, but we must hasten to add that some of these changes may be beyond our present instruments to detect, or rather that, with some substances, some of the changes may be so minute as to be immeasurable at the present time. Copper exposed to light does not produce great numbers of free electrons which have the velocity to escape from the attraction of the copper wire, but potassium, another element, does give off measurable quantities of these photoelectric electrons and cesium, still another element, reacts even better and is, for this reason, used in some photoelectric tubes in preference to other substances. In this case it is a question of the quantity, not the quality, of the action; likewise with iron and magnetic changes. The forces within iron allow the greatest changes to be evident, but magnetic action takes place in all other substances. Probably at this point we had better answer a question which has no doubt come to mind. What is meant when it is said that all the variables but one are held constant in an experiment or a measurement, as in the case of holding the plate voltage and filament current of a tube constant while the grid voltage is varied in order to see how the plate current varies? Or is this possible? Theoretically it is not possible, but so far as the accuracy of our measurement is concerned the very minute variation in the other factors caused by the change in the grid voltage is insignificant. And so with any set of forces, one or two of the group may be going through very rapid changes of magnitude, but the others are but slowly and minutely varying. This is not as theoretical or outside the realm of practice as we may imagine, particularly in the field of vacuum tubes and the electronic arts, where we are dealing with only a relatively few electrons at a time. For example: Recently a vacuum tube has been developed by B. J. Thompson, of the General Electric Company, which is capable of measuring 0.000,000,000,000,000,01 amperes. This means that as few as sixty-three electrons per second can be detected. With such detection as this made possible, we may expect to see more of the interactions of matter and energy put to work. 1. Electrons from the filament. constituting the plate current and the gas molecules in the space). 3. Electrons emitted due to the temperature of the grid. 4. Leakage (drift of electrons through the glass). 5 Positive ions emitted by the filament. 6. Electrons emitted from the grid under the influence of light (photoelectric electrons). off by the plate due to its bombardment by the plate current. In the above list we see the importance of atomic, electronic and photon (light and X-ray) interaction, and how, when our attention is directed to greater and greater accuracy, we must take account of more and more factors. It is very natural for us to be so familiar with a phenomena, having in our mind the most astounding actions involved, that we do not stop to think of the multitude of lesser effects. We have seen this in the above example, for one does not usually think of a vacuum as a producer of X-rays. Another example, under our nose, is the modern pentode tube. Years ago, if a vacuum tube "blued" it meant that there was gas present which was being ionized sufficiently to be luminous (similar to a modern neon tube). When a good pentode "blues" it is not due to the ionization of gas but to the fluorescing of the glass due to bombardment by electrons which have missed the plate. We have covered a lot of ground in attempting to point out that electrons, protons and photons are the mechanisms with which the physicist has been able to explain the various forms of energy and their interactions. Our review may seem to lack precision because we have not expressed the relations between the various factors in mathematical form, introduced equations and formulas. As we proceed, in following articles, to consider in more detail the phenomena which we have been enumerated above, we will be able to get down to definite quantitative relationships in some cases, but even then it is hoped, by a non-mathematical approach, we will be able to form our picture of what is taking place.